You’ll recognise the sleek cabinet design of this model if you’ve ever seen a professional retoucher or art designer at work. Pros in these kinds of fields will be able to sit down and get straight to work with the EIZO ColorEdge CG2420 24 Inch Monitor, thanks to its built-in self-calibration sensor that ensures optimal colour reproduction and image consistency, with brightness, chromacity and tone characteristics stabilising in less than three minutes. It offers the kind of colour fidelity professionals need, reproducing lush greens and blues faithfully, with a wide-gamut IPS (in-plane-switching) panel ensuring 99% Adobe RGB coverage. With a 1500:1 contrast ratio, the CG2420 also offers a True Black display. 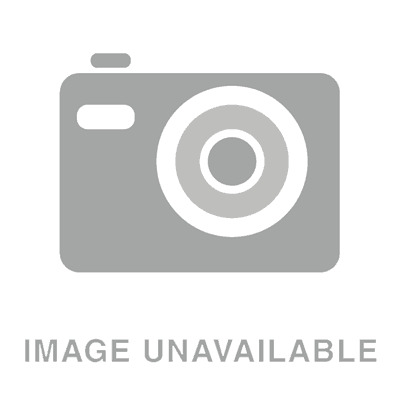 A tremendous tool for the professionals. 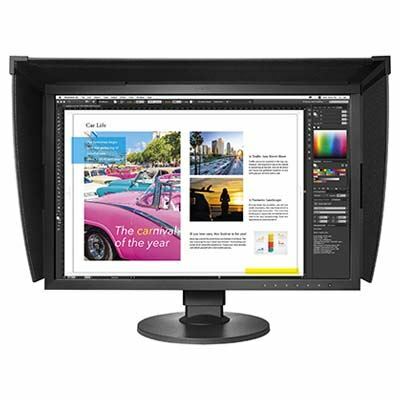 At a price much more friendly for hobbyists, the EIZO ColorEdge CG2420 24 Inch IPS Monitor still provides terrific results and is an excellent companion for photo editing. 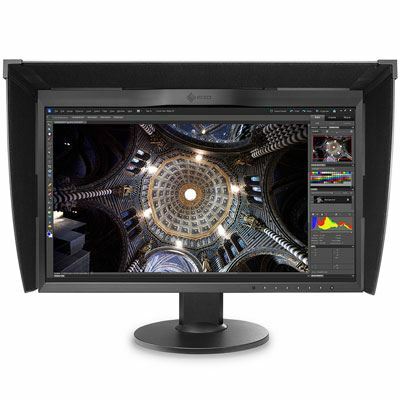 Its IPS panel reproduces 99% of the Adobe RGB colour space, and it comes bundled with ColorNavigator 6 Colour Management Software to allow you to calibrate your monitor at home to ensure pitch-perfect consistency. When its DisplayPort or HDMI inputs are used, the CG2420 can offer 10-bit display from a 16-bit look-up table, which in layman’s terms translates to the ability to show more than one billion colours simultaneously. It’s seriously impressive and well worth looking into if you plan to do lots of photo editing. 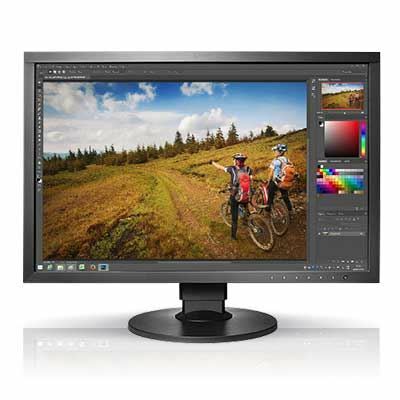 For focusing in on 4K content, the Eizo ColorEdge CG319X 31 inch Monitor is the monitor you need. It’s equipped with HLG and the PQ gamma curve that means video editors will also be able to work with HDR video, and its wide colour gamut means the images it displays are vibrant, punchy and faithful. The 31-inch display also allows for ample space to ensure that everything is exactly as you or your client needs it. Another amazing 4K monitor for the professionals, the EIZO ColorEdge CG248 24 inch 4K IPS Monitor offers the highest pixel density yet in the ColorEdge line-up, to the tune of a truly impressive 185ppi. You’ll now be able to appreciate the utmost in detail from your high-resolution images, to an extent that standard monitors simply cannot compete with, while video editors will also be well catered for thanks to the 4K ultra-high-definition screen. It may be enjoyable to get truly lost in a long photo or video editing session from time to time, but this can cause serious eye strain. 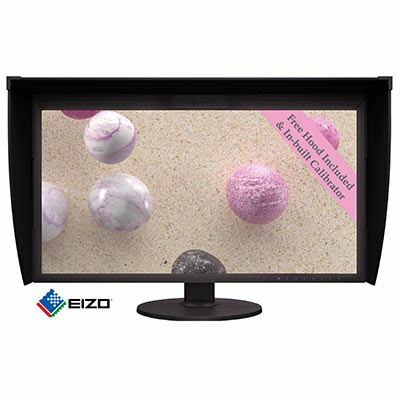 It’s important to look after yourself, and that’s why the EIZO FlexScan EV2450 23.8 Inch Monitor is a great choice. It’s designed for minimal power consumption, and is focused on reducing eye fatigue in its users, using EIZO’s EcoView technologies. With a contrast ratio of 1000:1 and a full HD native resolution, this monitor has more than everything you need to get some great edits done – without ruining your vision. Now that’s something to celebrate!